In our first newsletter for the year we share news of recent SIEF activities. In a major development, the Trustee of SIEF has entered into a Deed of Gift with National ICT Australia (NICTA) Ltd to establish the Future National ICT Industry Platform Program. The Program will fund substantial scale research activities in the field of information and communications technology (ICT). It is intended that the outcomes from the Program will benefit Australia by helping create new Australian technology-based industries and/or applied technology platforms that can reach global scale. The Program will extend over a period of up to six years. The first Challenge funded by SIEF addresses food provenance in Australia. Further information about the Program can be found on the SIEF website. The SIEF funded Major Research Infrastructure Program project National Resource Sciences Precinct: Advanced Resource Characterisation Facility (ARCF) completed in 2018. Funding from SIEF was used for the acquisition of a NanoSIMS and a Geoscience Atom Probe, and the development of the Maia Mapper, all integral elements of the facility. The development of this facility was led by the University of Western Australia in collaboration with CSIRO and Curtin University. The facility is a ground-breaking collaborative platform which will allow cutting-edge techniques that augment existing world-class infrastructure and help create a knowledge base that excels in geosciences research, industry application and training. A summary of the project is now available on the SIEF website. The recent completion of the Forests for the Future Research Project brings to an end SIEF’s Research Projects Program. This Program commenced in 2009 and has provided $77M to seventeen projects, with additional co-funding of $120M. The Forests Project was a collaboration between the ANU, University of Western Sydney and CSIRO, and places Australia at the forefront of climate-change related biological science spanning from laboratory to greenhouse to plantation in the first comprehensive attempt to link genomic and phenomic approaches to large-scale assessment of plant responses to elevated carbon dioxide. The results of the ground breaking research will be used by forest managers, plant breeders, fibre and carbon growers, and researchers to future proof not only forestry practices but all plant industries. A summary of the project is available on the SIEF website. The EDP program continues to prove its worth in supporting projects requiring financial support to accelerate their pathways to commercialisation. Two recently completed projects are now on track for commercialisation and industry adoption. EDP Funding from SIEF was used by CSIRO, the lead applicant, to consolidate its suite of hydrogen generating technologies and demonstrate a prototype system for the conversion of ammonia to high-purity hydrogen for use in fuel cell vehicles (FCVs). The technology developed will allow bulk hydrogen to be transported economically and efficiently in the form of liquid ammonia and then converted to hydrogen at point of use. Logistics: ammonia is already shipped and distributed around the world, providing an excellent foundation for new opportunities in the renewable energy export market. The hydrogen produced by the CSIRO rig was tested and shown to have lower than the industry standard of impurities regulated for hydrogen fuel cell vehicles. 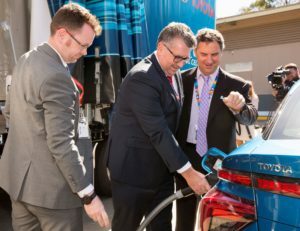 The validity of the technology was demonstrated during the project at CSIRO QCAT site in Pullenvale (Brisbane) where, in conjunction with project partners BOC, Toyota and Hyundai, two fuel cell vehicles were successfully refuelled – a Toyota Mirai and a Hyundai Nexo – using hydrogen produced from the demonstration rig. This event was a world-first demonstration of fuel-cell vehicles refuelling with hydrogen derived directly from ammonia. Read the media release about the demonstration day. Funding from SIEF was used by the collaborators CSIRO, Monash University and Energy Infrastructure Resources to overcome technical challenges and advance the CO2Gen technology to a working prototype capable of delivering two tonnes of carbon dioxide per year. CO2Gen recycles carbon dioxide directly from the atmosphere for customers in the industrial, commercial and domestic sectors, and uses novel materials as the core technology to enable the device. Existing supply chains are limited by their point sources of carbon dioxide, by their large and expensive fixed infrastructure, by long transport distances to end users and by entrenched supply chains, which creates monopoly-like terms of supply for customers. CO2Gen allows customers to produce their own carbon dioxide on-site and on-demand at lower costs and lower impact on the environment. With the successful completion of the project, the team is now seeking further investment and partners to demonstrate the technology in a field trial. More information about these projects can be found on the SIEF website. We wish both teams every success as they develop their technologies further.